Quiz hosted on Yahoo Movies to promote World War Z. Front page of Yahoo UK on 10th July 2013, linking to the quiz. Final sharing certificate from the quiz. 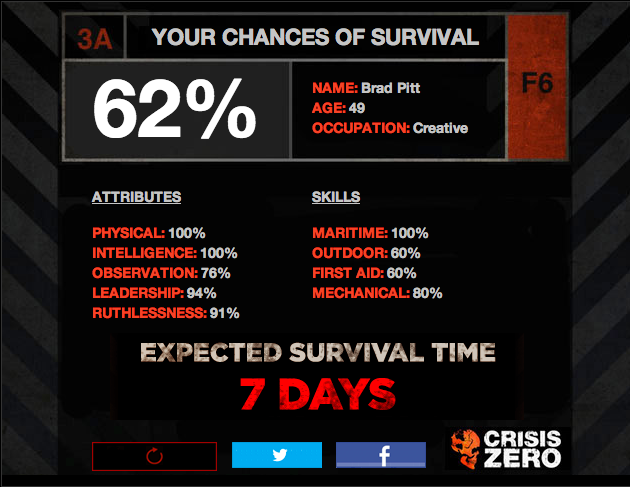 “Would you survive?” was a tie-in online quiz to promote the European launch of the Paramount film World War Z. Set in the in-world build-up to the events in the film, the quiz analyzed the player with questions on valuable skills and moral dilemmas, before giving them an estimated survival rating and life expectancy. The player could then share their results on social media. I held production responsibility for this web project, including management of a team of developers, artists and creatives, along with localisation. The quiz was featured on Yahoo home pages across Europe, and received over 300k unique players. National Lottery TV was a trial project to develop and run a video streaming website on behalf of Camelot, developed and maintained by Endemol Digital Media. The site carried draw results, videos of National Lottery Good Causes projects, interviews with jackpot winners, and promotional material. The trial was intended to increase retention on The National Lottery's site and to drive traffic to online games. I acted as Junior Digital Producer for Endemol on this project, and was responsible for ongoing development and maintenance of the site. Swordfight is a physical game developed by Kurt Bieg and Ramsey Nasser, subsequently constructed and exhibited by myself. Players wear Atari VCS joysticks in harnesses, and attempt to push the other player’s button with their joystick. Use of the hands is not allowed. This results in a distinctly after-dark form of jousting. The game received it’s European premiere at the Hide&Seek Weekender Party, and was subsequently shown at The Wild Rumpus 3.